There is, perhaps, no more potent symbol of the American imagination than the cowboy. Images of 10 gallon hats, wide open prairies and wild horses permeate our popular culture, and stories of these cowboys formed the basis of the first truly American genre: the Western. But in the masterful film, “The Rider,” director Chloe Zhao seeks to redefine the West by bringing an indigenous community to the forefront. While typical Westerns often marginalized the diverse communities that were victimized by western expansion and Manifest Destiny, Zhao puts reservation life under the microscope, crafting an intimate, soulful portrait of masculinity, identity and the enduring myth of the cowboy. Brady (Brady Jandreau), a young Sioux man living on the Pine Ridge Reservation in South Dakota, is a local household name because of his rodeo-riding past and his knack for training the sternest steeds. But Brady quietly suffers at home, recovering from a devastating head injury that has afflicted him with seizures. He lives with his horse trainer father Wayne (Tim Jandreau) and his mentally challenged teenage sister Lilly (Lilly Jandreau), the three of them grieving the death of their mother and wife and living hand-to-mouth in a mobile home. Brady spends his time drinking with friends and caring for his sister, eventually taking on odd jobs to keep his family afloat against the current of his father’s gambling debts. However, he longs for his glory days of competitive riding, eventually taking steps toward a prodigal return despite his doctors’ adamant advice against doing so. 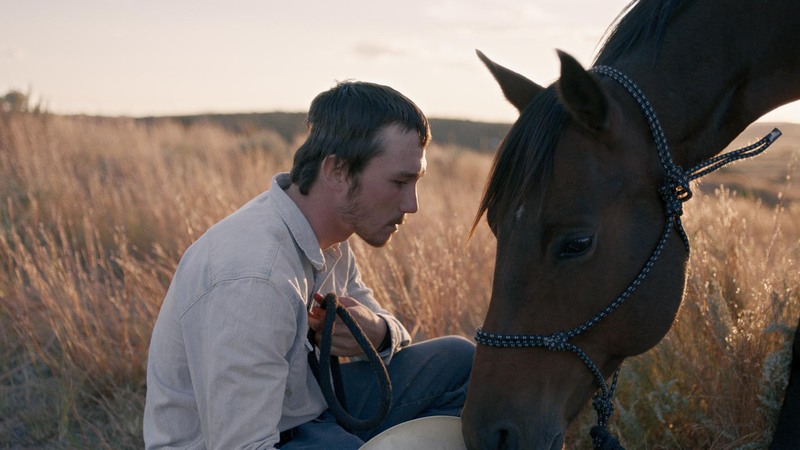 “The Rider” demonstrates the skill and fully formed voice of a born master filmmaker. Zhao captures the South Dakotan landscapes with a painter’s eye and plainspoken poetics, with Joshua James Richards’ handheld cinematography capturing the stillness of the land — as well as the anxiety creeping underneath it. There’s a precise freedom to their camera, accompanied by pitch-perfect editing holds on an image or cuts through it at precisely the right moment. Brady, a non-professional actor and real-life former rodeo rider, and his family perform fictionalized versions of themselves, acting out their own life stories in front of Zhao’s lens. Jandreau is a natural screen presence, one that commands the frame from the opening to closing shot. He exudes a quiet despair cloaked in a calm, confident demeanor, expressing more with his face in a closeup than some professional actors can with their entire body. This approach of bringing real people into the filmmaking process to act out their truths isn’t exactly a new one. It dates back to the Italian Neorealists of the ‘30s and ‘40s — and even the silent documentaries of filmmaker Robert J. Flaherty — but Zhao breathes new life into this rich, storied history of docufictional technique. It’s clear that Zhao and her cast worked closely to craft an elegant fiction out of Brady’s rough-hewn existence, one that refuses to indulge in easy speechifying or cliche. The film never makes an outright political statement, yet it is enriched by issues of Native-American identity that lurk on the edges of the frame. By the mere presence of these issues, Zhao opens up a thoughtful dialogue about American settler society and the consequences of economic inequality and structural racism. However, she and Brady focus solely on the Brady’s life — in all its glory and pain — and never become lassoed by the temptations of aestheticized poverty. In short, she doesn’t use Brady to make a point. Instead, she empowers him and his community by providing an outlet through which to tell their stories. Zhao further enriches her film with subtextual deconstructions of the Western genre itself, rather than merely adhering to a tried-and-true social realist template, creating a richer film as a result. “The Rider” shares similarities with Nicholas Ray’s classic melodrama “The Lusty Men,” which uses rodeo-riding as a metaphor for the toxic masculine ideals that are attached to the cowboy. But Zhao does several things differently. While Ray’s cowboys were born into their cultural capital, even haunted by it, Brady is deeply passionate in asserting his own autonomy, doing so by taking part in the symbolic acts of freedom of which white men have often taken ownership — borderline suicidal horseback riding chief among them. He’s a true cowboy in every sense of the word, and Zhao explores his masculinity with an acute sensitivity and lightness of touch. She shows the real physical consequences of his lifestyle in devastating detail, but refuses to analyze him. This is a testament to her filmmaking, one that both embraces and subverts the iconography that defines Brady himself and all his complexities and ironies — exposing the false divisions between fact and fiction. “The Rider” is a film that has more value than can be stated — as ethnography, as a document of real life, as a political work of art — yet it avoids easy classification by always putting story and character first. And that’s what makes it such a remarkably human work. It’s a film that fulfills the democratic potentials of cinema by taking the power of an age-old genre and destroying its privileged authorship, all while showcasing a remarkable story that is seldom told. Through their shared fiction, Zhao and Jandreau discover this truth and share it with the beauty and empathy it deserves, one outsider to another.